Sacred Spring highlights the Viennese Secession, an influential group of artists who sought to break free from the academic art of the past. Founded in 1898, the group shared their ideas through public exhibitions and images and texts for journals, including Ver Sacrum or Sacred Spring. Two calendar pages made by Gustav Klimt and Kolomon Moser for the 1901 issue of Ver Sacrum are featured as well as three posters by Klimt, Moser, and Egon Schiele that advertise the Viennese Secession’s exhibitions in 1898, 1899, and 1918 respectively. 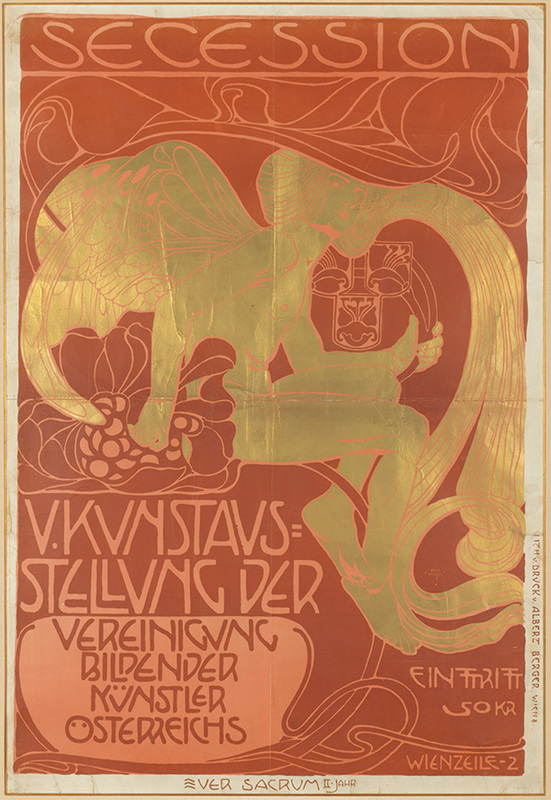 One of the images most frequently associated with the Art Nouveau style—Peter Behren’s influential 1898 color woodcut The Kiss—is among the beguiling works on view, as is Jan Toorop’s striking 1894 color lithograph poster advertising Delft Salad Oil. Toorop’s design was so influential that the Art Nouveau movement in the Netherlands is often referred to as the Slaolie (Salad Oil) style. The Hoffberger bequest is a major and important addition to the Museum’s collection of late 19th-century and modern works on paper. Austrian, Dutch, and German posters expand upon and add a new dimension to the Museum’s holdings of French and American posters, including deep pockets of works by Henri de Toulouse-Lautrec and Jules Chéret. This exhibition is curated by Rena Hoisington, Senior Curator of Prints, Drawings, and Photographs. More than a dozen turn-of-the-century prints and posters celebrate the varied styles of the international Art Nouveau movement and the generosity of the late Baltimore philanthropist LeRoy E. Hoffberger.